I had no idea what garum was until I read Steven Saylor’s Roma Sub Rosa series of detective novels set in ancient Rome. Now I know that it’s a salty, fermented fish sauce that the Romans used to liberally garnish their dishes with. As for asafoetida, I was already quite familiar with it, having grown up in India, where it’s a popular culinary ingredient. I used to wonder what compelled my mother to use such a pungent, even fetid, spice in her cooking, but since my mother is a great cook, it didn’t make sense to argue with her. 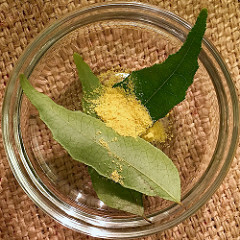 It was only later that I found out, from reading historical mysteries, that the Romans were almost as fond of asafoetida as my mother is, using it in a broad variety of dishes, and holding it in great acclaim for all manner of healthful benefits. Ironically, despite the Romans’ love of garum and asafoetida, both are almost non-existent in European cuisine as we know it today. What does any of this culinary arcana have to do with historical mysteries? The short answer is that I’m a foodie. And as such, descriptions of food and cuisine in the historical mysteries I devour (no pun intended) add to my appreciation of the genre almost as much as historical settings, page-turning plotlines and character development do. But there is a slightly longer answer as well. Part of what attracts me to historical novels in the first place is the opportunity to learn (or in some cases re-learn) history in a way that really sparks my imagination. The challenge in reading history, as Srikrishna puts it so well in his piece elsewhere on this blog, “is that it could easily become a mind-numbing series of who blinded, deposed, imprisoned, or married whom, with names, places and dates running into one another.” By contrast, historical fiction, when done well, gets me away from the dry minutiae of the who-did-what-to-whom kind of narrative and instead directly embeds me in the sights, smells, colors, social interactions, and daily goings-on of the particular locale that it’s set in. And isn’t food an essential element of that embeddedness? For a more in-depth exposition of the cuisine of the ancients, John Donahue’s Food and Drink in Antiquity is an invaluable sourcebook. Also, don’t miss Steven Saylor’s excellent little essay on Roman cuisine where you can read his take on garum and asafoetida. So the next time you read a historical mystery, soak it all in – atmosphere, cuisine and all – even if that involves a fermented fish sauce and a spice that is referred to in some parts of the world as the Devil’s Dung!